The coach of the Barça Legends, José Mari Bakero, has added three more names to the list that was announced just over a month ago. 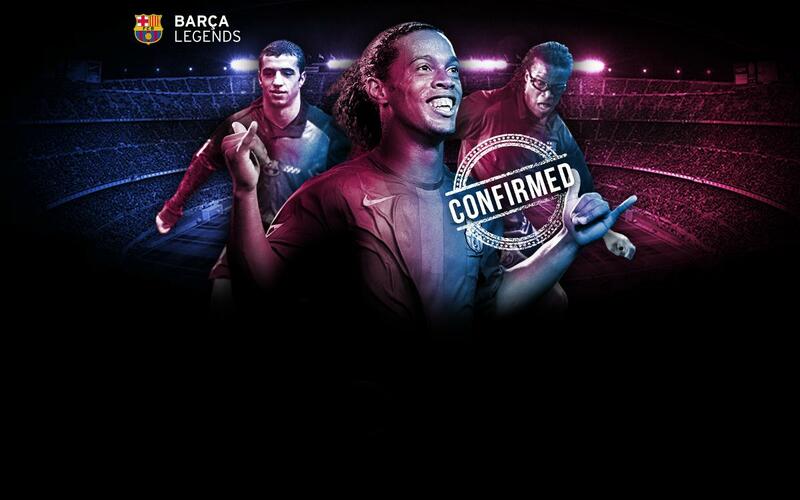 Ronaldinho, Edgar Davids and Simao Sabrosa will all be present on 30 June at Camp Nou for the game against Manchester United Legends which kicks off at 7.00pm CET. This will be the first time that the Brazilian star returns to what was his home between 2003 and 2008 to play in a Barça shirt. Buy your ticketshere for Barça Legends v Manchester United legends. Ronaldinho, Davids and Simao join names such as Angoy, Guzmán, Juan Carlos, Popescu, Nadal, Belletti, Andersson, Déhu, Edmílson, Goikoetxea, Mendieta, Giuly and Julio Salinas in the squad. It is expected in the next few players that more players will be announced from FC Barcelona’s history. For the Manchester United Legends, players such Blomqvist, Fortune, Poborsky, Berbatov, Ji Sung Park, Silvestre and Dwight Yorke have been confirmed for the game at Camp Nou. After the success of the game in Beirut, Lebanon in which the blaugranes beat a team of Real Madrid Leyendas 3-2 thanks to two goals from Giuly, one from Simao and three assists from Ronaldinho, this will be the first game for the team at home in Camp Nou. The blaugranes will face Manchester United Legends once again at Old Trafford on 2 September at 3.00pm local time. The match between the Legends from Barça and those from Manchester United will see all the proceeds from the game go to PCCB project (Pediatric Cancer Center Barcelona) at the Sant Joan de Déu Hospital which aims to provide treatment for all child cancer cases. Tickets will be between 10 euros and 19 euros and the profits will go to help build a new centre and fund research into child cancer. Tickets for the game are already on sale and can be acquired via the usual Club channels. You can buy tickets here for Barça Legends and Manchester United legends at Camp Nou, as well as via the Club’s ticket office, Ticketmaster, and entradas.com. Barça Legends is the product of an FC Barcelona programme that has as its aim to demonstrate the value of the figure of the players who have worn the Club’s famous shirt. The project aims to contribute to the globalisation of the Barça brand and promote its values via former players. Also, it aims to help players once they have retired from elite sport. The initiative will see various game and related events take place all around the world.